To show railway staff how the train service will operate and where the trains will start and finish, a timetable must be drawn up. This is not the one the passengers see, it is a detailed one for staff. It is called “the working timetable”. It shows all details of all train movements, including empty moves and times in and out of depots. It shows each train or trip identity and intermediate times for some, if not all stations. Here is a sample, showing the start up of the imaginary Forest Line service in the early morning. The timetable is displayed in easy to read format. The two directions of running appear one above the other. Each trip is headed by the trip number. Empty trains have their times in italics, the platform numbers are included and the letter "s" is added to any platform where the crew has to "step back". This will occur for any train with a turnround of three minutes or less. A number of things have to be considered in planning the timetable. For example, at each terminus, the platform use must be planned to avoid conflicts between arriving and departing trains as they move over the crossovers. Some trains entering service have to reverse in the platform at Oak and Elm and this must be done without delaying following trains. As the service builds up towards the morning peak, the turnround times will reduce at the terminals and, when all 13 trains are in service, it will be down to two minutes. Note that all the trains are allocated a number and that it can be helpful if this number changes with each trip. This is useful during disruptions of the service and to track car mileage. Usually, crews are allocated a number as well and this may also be displayed in the timetable against the trip. Figure 2: A timetable graph for the section of line between Shrewsbury and Aberystwyth. Both directions of traffic and passenger and freight trains are shown. Horizontal lines show the time that a train is stopped at a station or yard. 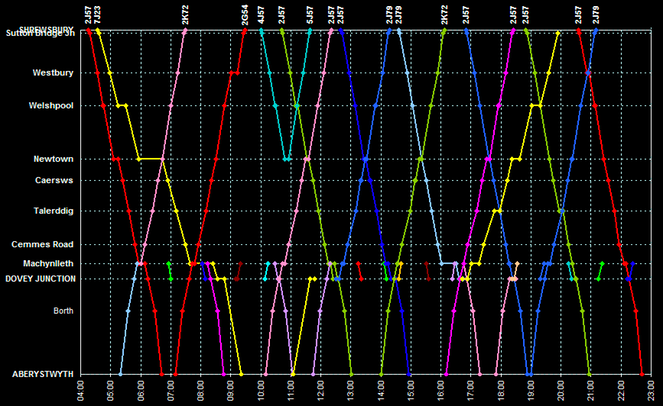 Stations and passing points are shown along the Y axis with time on the x axis. Train ID codes are shown along the top of the graph. Source: www.2d53.co.uk. Timetables can be written in tabular form or as graphs. Where there is mixed traffic with varying train speeds, the graph form is easier to prepare and use. Both types are nowadays generated by computer. This has replaced the old manual system of using a pencil and eraser - there were always a lot of alterations to do. 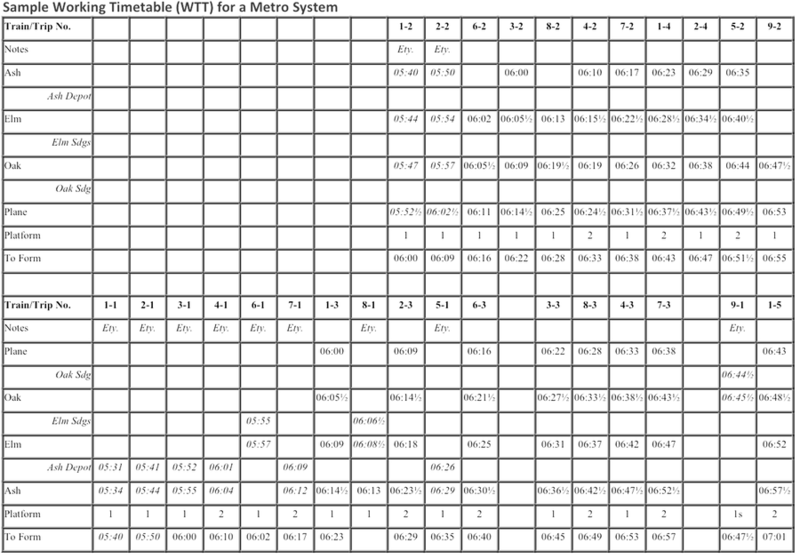 A typical computer programme used for train timetable simulation and compilation is a Swiss tool called Open Track.